I'm the primary commercial lines client assistant and am responsible for all the clients data to be entered into our system correctly. I am very easy to work with and take great pride in the details of my work. 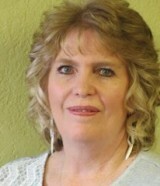 Teri is a very dependable person and makes every effort to assist customers with their insurance needs. Teri is very good at seeing things through to the end. Teri is actively involved in her church and loves her volunteer work with the Sunday school children. She is the proud mother of 3, and grandmother of 2. She can be found watching classic movies, camping, or scrapbooking- her favorite hobby.